Photograph used with permission from Lakeland Trust. Anne Clifford, Countess of Pembroke, Dorset and Montgomery has been called many things. She was well versed in history, theology, geography, the arts and literature. She was an astute financial manager, and was politically canny. Her letters, accounts, and her Great Books of Record all tell us this. And this is how most people view the Lady Anne, as an intelligent, pious and gritty Lady. Certainly she was all of these things. However her autobiographical writing, recently published by Manchester University Press, reveals that Anne Clifford also had a keen sense of fun. Her first surviving record of her life, is her 1603 memoir. Here she recalls her thirteen year old self getting into a bit of trouble for riding with a Mr Menerell. Her mother punished her by forcing her to sleep alone, which she records ‘I could not endure’. However, her cousin Frances Bourchier got the key to Anne’s room and ‘lay in my chamber with me, which was the first time I loved her so well’. 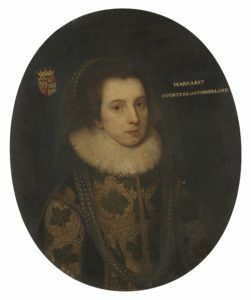 During that summer she and her favourite cousins Frances, Francis Russell and Mary Cary could often be found eating too much fruit, vying for places to see the coronation of James I, and generally enjoying the freedom of that summer where the change of monarchs also meant disruption to the general routine of young people’s lives. Anne continued throughout her teenage years to dance in the court masques of Queen Anne, those elaborate productions of costumes, dance, and scenery. She enjoyed the whirl of court life, as she and her mother strategised to find the best marriage for her. In 1609 she married Richard Sackville, the dashing Earl of Dorset. The two were in love and after more than two years of negotiations and set backs, had a rushed wedding in her mother’s bed chamber. They later had to petition the Archbishop of Canterbury to have the marriage recognised as valid. Certainly Anne’s marriage to Richard was not all fun and games, but even in the most difficult times we see Anne attempting to enjoy herself. One her favourite games at Knole House in Kent where she spent much of her married life with Richard, was Barley Break which she played often in the summer of 1617. She recalls, ‘we played at Barley Break on the Green’ and while this may sound quite tame, Barley Break was anything but tame. It was a game where two couples clasp hands and a third couple stood in between them in ‘hell’. This couple attempted to catch the other two couples who would ‘break’ and change partners if it looked like they are going to be caught. It was a very high spirited game and one can imagine quite hilarious in the elaborate dress of the day. When Anne was less energetic she played cards – not very well. She recalls in 1619 that she lost fifteen pounds to Lady Carr and Lady Grey playing Glecko. A few months later she lost twenty seven pounds again to Lady Grey. After that she took up playing with her husband’s steward, Richard Amherst, perhaps hoping to improve her luck or develop her skill. It didn’t work. In November she writes with disgust, ‘I had such ill luck playing with Legg and Basket (two servants at Knole) at Glecko that I said I would not play again in six months’. As Anne matured her reputation for being, as her husband Richard once called her, ‘a sober woman’, increased. But we see that Christmas at the Lady Anne’s castles was anything but a sober affair. She records in December 1669 paying for ‘5 Hogsheads (or 48 gallons) of beer…besides wine’, and ‘4 roundlets of Sack’—that is 16 gallons of the fortified wine! She bought in sugar, lemons, oranges and raisins. She records paying for massive amounts of beef and mutton, as well as the more rare boar meat. She purchased ‘several sorts of spices for my house this Christmas’, sparing no expense in creating rich meals for her household during the holidays. She records buying devotional books for gifts at Christmas, which were perhaps not quite so fun, but also more useful Almanacs, gloves, ribbons, lace, linen and locks (engraved with her initials, clearly a most desirable gift), as well as distributing money. She invited in the players and musicians to entertain her household at Christmas, and records in December 1669 that ‘nine players came hither’. One wonders what play they performed. Christmas in 1671 was even more extravagant, when ‘several players and New Year’s Boys came about this Christmas’. The Lady Anne was eighty-one years old but still clearly knew how to have a good time. From 1649 until her death in 1676 the Lady Anne lived in her castles in the North: Skipton, Brough, Brougham, Pendragon and Appleby. She was of course too old and too eminent to be able to join in a game of Barley Break, and too wise to play Glecko with her servants. But she still enjoyed a show, and made each of her moves between castles into a high holiday for the community. In her yearly memoirs from 1650-1676 she records the chief gentry of the area riding alongside her in her horse litter, while the bells of each town she came through rang out, and the village musicians played, and money was distributed to the excited bystanders who cheered her through the byways of Yorkshire and Westmorland. Anne Clifford’s autobiographies reveal a woman who was sensitive, strong and resilient. But one shouldn’t miss the glimpses she gives us of her warm nature and ability to enjoy life despite all its challenges. 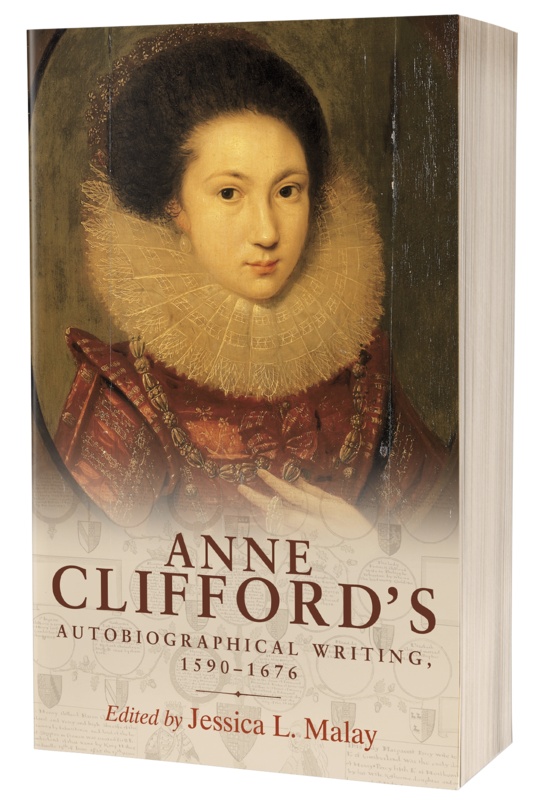 Anne Clifford’s Autobiographical Writing: 1590-1676, edited by Jessica L. Malay is out now! Jessica will be at Skipton Castle on Sunday 4th March at 1pm talking more about Lady Anne Clifford and signing copies of her book. All welcome. 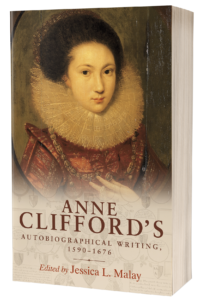 Visit our Women’s History Month sale page, with 50% off a selection of titles, including Anne Clifford’s Autobiographical Writing.